Why Rely On Outside Consultants Like Rebecca? | Fulcrum ConsultingWorks Inc. 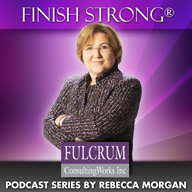 This entry was posted in General-Business, Operational-Excellence, Podcast Series: Finish Strong® and tagged Benchmark, consulting, Excellence by Becky. Bookmark the permalink.